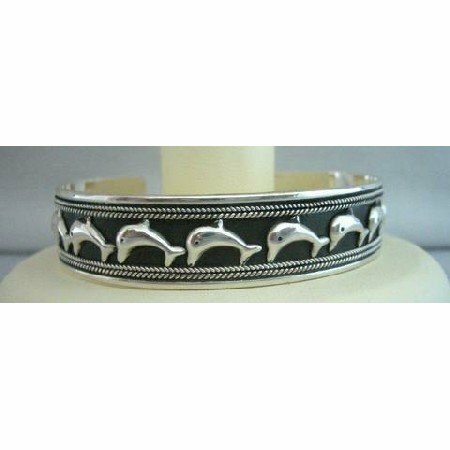 This Bali Style Dolphins on Parade Genuine sterling silver cuff bracelet is a great piece to wear. Everyone will comment on each and every adorable silver Dolphin. It is made of Genuine sterling silver with stamped 92.5 for its originality. The Dolphin bracelet enjoy the parade! The cuff is tapered along the sides, with rounded corners at the ends. Open-back styling makes this handsome piece easy to slip on and off the wrist.